Orthodontic treatment has come a long way, even in the last 5 to 10 years. Still, there are some myths that persist, despite industry changes and improvements. 1: My wisdom teeth made my teeth crooked. It’s a common belief that when your wisdom teeth come in, they cause crowding and push your other teeth out of alignment. In reality, there’s no evidence that this is the case. Even if you’ve already had your wisdom teeth extracted, your teeth can and probably will drift over time, which is one of the reasons orthodontic care is so important. 2: I’m too old for braces. Adults with crooked teeth often think it’s too late for them to get braces for cosmetic tooth straightening. Actually, about 20% of all orthodontic patients are adults. Braces work just as well on a 40 year old mouth as one 15 years old – there aren’t age restrictions. Since teeth move over time, you might even find more benefit in orthodontia as an adult. Of course, if your concerns are cosmetic, there are some less obvious options to help you get the smile you want. Invisible aligners are clear, can be removed for things like eating and dental care, and might be an option for you. Lingual braces go on the backs of your teeth so they’re far less obvious, but some people find them a little more uncomfortable. 3: Tooth straightening is extremely painful. Moving your teeth is likely to be uncomfortable, but that’s a very different thing than painful. 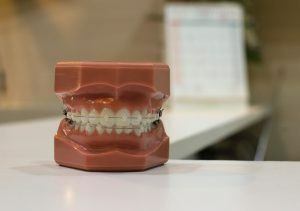 Orthodontic technology has significantly improved over time, and what might have once been an extremely unpleasant experience is now much more bearable. The discomfort involved in orthodontic adjustment is usually very minor – at its worst, it can be entirely eliminated with an over-the-counter pain reliever. Also, more pain does not mean more gain. Some patients request that their braces be tightened to extremes in order to make treatment go faster, but in truth, there has to be a balance so that teeth can be moved without risking any damage to your dental health. A good orthodontist knows how to strike that balance, and your treatment will go as quickly as possible. 4: Braces take a really long time to work. Depending on the type of treatment you need, getting braces might require a commitment of several years, but that’s not always the case. In fact, many adults can receive cosmetic orthodontic treatment in as little as six months! Before you make assumptions, talk to your orthodontist. You might be surprised at how quickly you can achieve beautiful results. 5: Orthodontia is too expensive. Some people never consider cosmetic orthodontic care because they mistakenly believe they can’t afford a beautiful smile. Orthodontia is one of the most cost effective ways to improve your health and appearance. Orthodontic care is an investment in yourself and your future, and with multiple treatment options, price points, and payment plans available, you can definitely afford it. You might not need as comprehensive of treatment as you expect. And when you’re still enjoying the benefits years from now, you’ll be glad you made that investment!